July 2013 - The Crazy Month. So many fun events going on at RPC - rolling one into another. But that still did not diminish the annual Guy's Trip. 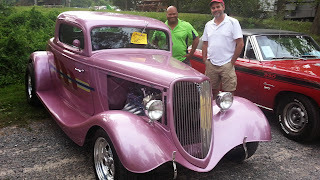 A week later, and I can finally take a few minutes to write about the awesome time Kev, Ed, and I had in the Jonestown Pa area. Friday Morn, I had just finished our Youth Mission Team experience with TPP and RPC. Was a great week of delving into our faith, helping others, and learning about ourselves and each other in the process. It was a joy to spend time with the youth and "yellowshirts", and the various church teams from Maryland, Ohio, and NJ. After finishing a few items at Roxborough Presbyterian, I headed home, showered, had pizza with Emily and Amy (Kimberly had stayed to help with the DayCamp that was run at RPC), grabbed my already packed backpack and head out to pickup Ed. Twenty minutes later we unloaded our stuff at RoadAbode, hitched up Amy's Honda to the back, and in twenty minutes more were picking up Kev at his door. By 4pm on Friday though, all that mattered was that we guys were settling in at Jonestown KOA, formerly Lickdale Campground. What's great about this camping spot is the Swatara River (more of a creek) which our campsite was nestled right beside. From our concrete patio we could walk a few steps right down into the creek! Once we had unpacked a few things and got electric and cable plugged in, level and items situated, we headed out to find dinner. 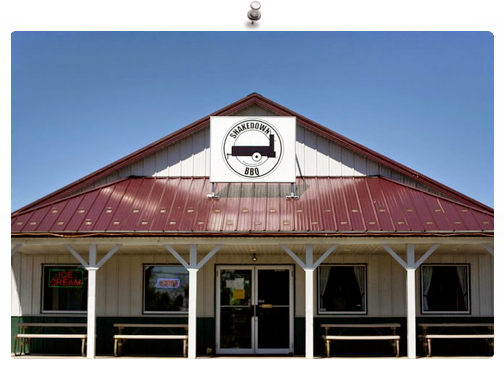 Looking for a BBQ place, Google Now led us to a little oasis in the neighboring cornfields called ShakeDown Barbecue. This small eatery looked like a local "seed & feed" outside, but once you cross the threshold, wafting scents of smokey meat and the twang of blues guitar hits and told you otherwise. It felt like we were in a Hipster designated, South Street Philly Landmark. No - this was on a back-road, Central PA Cornfield! The clientele was a diverse mix - anything from Skinny-jeaned, glassed wearin' intellectuals; SUV drivin' poloed and khaki'd dads; to tattooed mountains wearing leather. All present had one objective though - good food. And Shakedown delivered in heaping mounds of smokey, meaty goodness. I never had brisket on a sandwich taste so good! After getting comfortably full at Shakedown, we popped our next location into the GPS - Linda's Speedway. Linda's Speedway is a Dirt Rack off Route 80, this small oval track brings a ton of fun and excitement for the $6 entrance fee. (free parking too!) On the way over, we had a quick downpour, but as we got closer to the track, the skies lightened again, and the air felt cooler. What we didn't know was how the short downpour has effected the dirt track. The track staff had to pack-down and help dry the now muddy dirt-track. This delayed racing by over an hour. We did get entertained by the driving skills of the staff, and the locals as they filled the grandstands. There were three types of cars that night at Linda's speedway. Sprints - which look like modified go-carts with big wings on top; Legends, which have the appearance of mini versions of 1940's coupes; and Chargers, which most resembled what you may see on the NASCAR Circuit - if NASCAR's budget got extremely stripped. 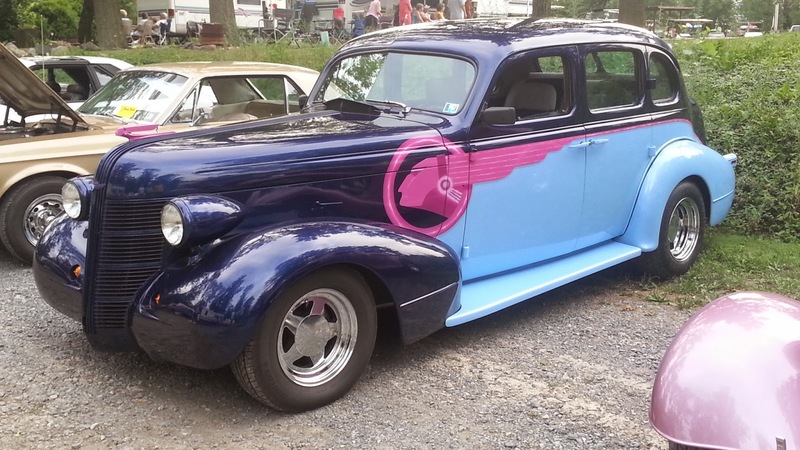 All the Chargers looked like they were at one time Ford Mustangs, just really knocked around mustangs. But what all these cars lacked in size & paint they made up in raw racing power. Once the long wait til the track was over, and time trials for position were done - the real racing began. It was exciting! There were a few bumps and crashes, one car even flipped - but luckily non were hurt. It was quite cool - because all their families were sitting right there with you, no "reserved seating" no roped off areas. Just "good ol' boys" and their families out for a night of fun. Glad we got to join in - even though it went till after midnight. This day the only reason we left the campground was for lunch at Wendy's - and that was only a short walk out the driveway and across the street. Jonestown KOA had everything we needed or wanted to do for the day. Our morning started late - a first for a long time sleeping in til around 9am. We enjoyed just sitting on our patio drinking coffee and watching the waters of the Swatara drift past. The waters looked so inviting that we threw our swim trunks on and took a dip. The waters were low, so we each just found a deeper pool and lounged in the water - no real swimming involved. Moving around some of the smooth rocks, we found a few five inch crawdads, though they were speedy enough not to be caught. We floated in the waters until our skin was pruning - then grabbed our shower gear and washed off the creek water. 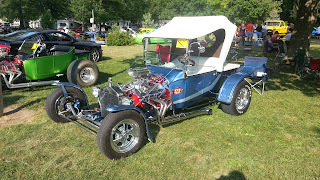 The campground had a car show going on right on the grounds - which didn't really get moving till the afternoon. There were plenty of antique and modified rods to check out. A quick run over to Wendy's for a burger for lunch. had a great "Q&A" session about faith in Christ and how important it is in Ed's and my day to day. Seemed to stir some good discussion for our afternoon. For our dinner, the campground had a great selection of carnival-style foods. We all went for the broasted chicken, which was crispy and delicious. After dinner we again just enjoyed the evening air and some aged scotch that Ed had brought along. Once night fell, we retired inside to watch a little television, then sleep. Simple enjoyable day! Sunday was our "get off our butts and go hiking day" We considered doing a leisurely tubing run down the Swatara, but the office has cancelled tubing, canoeing and kayaking rentals due to portions of the river being too low. 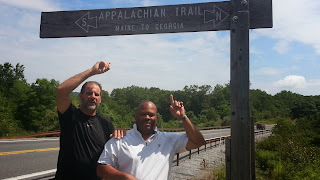 Instead we hiked part of the Appalachian Trail that passes thru the Swatara State Park We were glad we did, because we met a few thru hikers along the way. Amazing stories of a two brothers and a son hiking up to New York (Young man was twelve) and a a trio that was hiking from Georgia all the way thru to Maine. Was funny that once they found out where we were from - they just wanted to know "Where should we get a Philly Cheesesteak?" After hiking on the trail - we went to the State Park's version of "Forbidden Drive" in Philly. There we were able to look thru the old fossil beds that were dumped there during the construction of Route 80. Did not find any fossils, but was still fun to try. Feeling like something to eat - we headed to a Google Now suggestion - The Farmer's Wife Restaurant. a homestyle place - with lots on the menu. I was able to enjoy my first gyro - a great greek -style taco-like sandwich. While eating we discussed our last trip to the Fingerlakes Wineries and Watkins Glen. I did a quick websearch and found West Hanover Wineries and vineyard. We decided to check it out. sweetness of an Ice Wine, but not the thick syrupy "legs". Other interesting wines we tried included a Buckwheat Honey Mead, Sour Cherry, and Blackberry. Finding wineries may become an annual event. 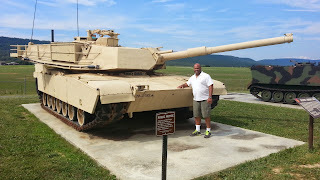 After our meal, winery and adventures on the trails, we decided to check out the military hardware up the road at Fort Indiantown Gap, a National Guard Training Center. Once we looped around there (passed the main road by the mistake) we hopped out of the car and checked out the tanks, planes and helicopters. Ed shared some stories of his service. Wandering around the military equipment we felt a need for some ice cream - so we headed to Dairy Queen, just up the road from the campground. Once back streamside, we sampled some of our winery purchases, and relaxed. In the evening we went for more ice cream, but this time it was a free ice cream event at the Jonestown Community Park. it was fun sitting at a park bench, listening to the one-man band, and chatting with the families and young girls representing the Dairy Maid and Dairy Princess. Small town Fun! Last Day is usually a pack up day when with my girls, but the guys had other ideas. We headed back out to The Farmer's Wife Restaurant for a filling breakfast, then drove to Indian Echo Caverns, outside Hershey. After a short wait, we took the guided tour which starts on the banks of the same river we are camped on - the Swatara! The cave was a cool 55 degrees, and stays that way throughout the years. We were entertained by the historic tales of the cavern - from the "mystery box" to the tale of the hermit of Indian Echo Cavern. We needed to head back to our campsite right after - as checkout time was 2pm. We were able to get RoadAbode together pretty quickly, and were on the road home by a little after two. No issues - just open highway. Another great time for the Guys Summer Trip!